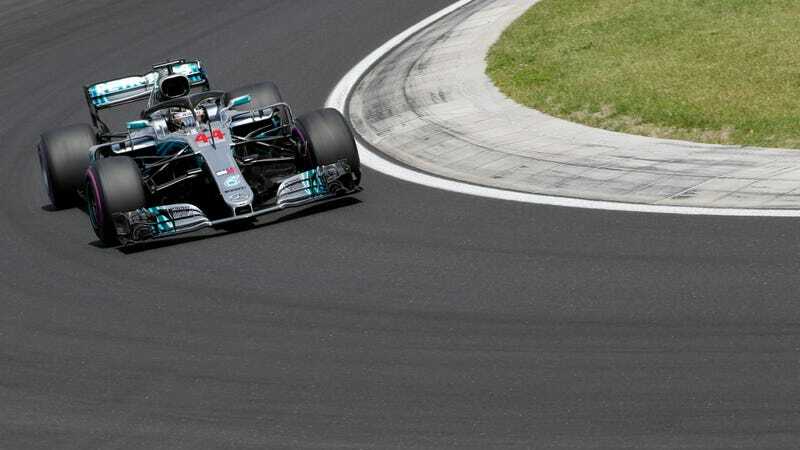 After a nasty rain during Saturday’s qualifying sessions in which Lewis Hamilton secured a dominant pole position, and following on from Hamilton’s successes in recent races, this Hungarian Grand Prix looked a foregone conclusion. After the starting lights went out and Lewis had gone ahead at the first corner as teammate Valtteri Bottas slotted in behind, that conclusion looked pretty secure. Following a faulty Ferrari pit stop in which points contender Sebastian Vettel’s front left wheel gun took a couple of seconds longer than usual, Lewis Hamilton knew he had nothing standing in his way for the win. This race fell completely to Lewis and the Mercedes team at the front, as they put in a perfect race from start to finish. They managed traffic well, and timed their pit stops perfectly to come home with a quite comfortable margin to second. It was Bottas that flailed about a bit in the closing stages of the race that caused some excitement. First, as Vettel closed on the second placed Mercedes, Bottas older tires were not doing him any favors. When Vettel finally set up the pass, Bottas desperately stuck his nose inside as Vettel attempted to make the pass around the outside. The contact didn’t take either car out of the race, but it easily could have. Vettel spent a total of twenty laps behind Bottas, which precluded him from taking any fight to Hamilton at the front. Just a few corners later, the slowing Bottas with a damaged wing came under pressure from a hard charging Daniel Ricciardo. As Ricciardo attempted a pass around the outside at turn 1, Bottas left his braking too late and locked up a rear wheel, sending him sideways into the side pod of Ricciardo’s Red Bull. One lap later, the Red Bull recovered to make the pass stick with an over-under that Bottas did not defend against. Having let both Ferraris and a Red Bull through, Bottas finished in fifth position. Ricciardo’s fight was hardly covered by the television commentators, but it certainly deserves some applause. After suffering a Q2 knockout, Ricciardo started the Grand Prix from 12th and fell back to 16th on the opening lap after being hit by Marcus Ericsson. Fighting back from 16th to fourth is a commendable effort by both Daniel and the team. Ricciardo attributes the success to his and the team’s BDE. Similarly, Pierre Gasly’s run in the Toro Rosso Honda ended with him in 6th position, scoring only his third run into the points this season, though perhaps most crucially he remained the final driver on the lead lap. And Fernando Alonso scored 8th place points on his 37th birthday. Which of You Nerds Is Going to Buy This Pirelli Bluetooth Speaker?